Cute name, isn’t it? Because, you see, it sounds like “duel”, as in a battle, but really refers to the “dual” races of the…oh, never mind. We all get it. Yes, less than a week from the thrills of the Indy 500, the IZOD IndyCar Series takes a jaunt north to Belle Isle, where a pair of weekend races will both count for full points. That means a potential huge points swing from this weekend, as the first part of a trying June schedule makes this as much an endurance contest among teams as anything. We’re looking a twin 70 lap races, coming out to about 164 miles each. The races are on ABC, which is great news for those without cable, but also disappointing for those who enjoy the more robust coverage we see from NBC Sports. Get used to it; every race except Milwaukee between now and the start of July is ABC-bound. Let’s hope they kick up the coverage, and give the racing we’ve seen the enthusiasm it deserves! Qualifying/Rules: Yes, there will be two rounds of qualifying, one for each race. The first, held Friday afternoon, will be along traditional Firestone Fast 6 guidelines. Qualifying for the second race will be held Saturday morning, well before Race 1, with the cars split into two groups simply to manage traffic. The second round of qualifying will simply slot all cars from fastest to slowest qualifying laps. Don't sweat it; it'll all make sense soon enough. Additionally, SONAX will be offering a $50,000 bonus to any driver who can win both races, so that's something to keep in mind. Mojo For The 500 Champ? : Tony Kanaan has had a whirlwind week of public appearances, and now he'll take back to the track as our most recent Indianapolis 500 winner. Dario Franchitti managed a very good result here last year after winning Indy; can Kanaan keep his momentum going? He was a sharp P6 in Detroit last year, and is still very much in the title hunt, currently only 44 points behind Marco Andretti. If he can string together a few more excellent results, he could become a title contender few foresaw in their season previews. Panther Problems: Let's put it plainly: JR Hildebrand is out, Ryan Brisoce is in for this weekend. Hildebrand finished last at Indy following an early crash, and now we get to see if Briscoe can hack it in a seat where Vitor Meira, Dan Wheldon, and now Hildebrand apparently didn't cut it for owner John Barnes. Best of luck with that task. Ganassi’s Gnashed Teeth: Well, that certainly wasn’t the Indy 500 Chip Ganassi wanted. 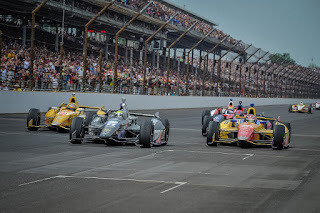 Between Dario Franchitti crashing late, Ryan Briscoe never really running up front, and Scott Dixon being essentially a non-factor on the day, it was a dreadful month one of the “Big Three” teams. Charlie Kimball was really the only bright spot, overcoming early mechanical woes to grab his second straight Indy Top 10. Still, there are reasons for optimism. Scott Dixon and Dario Franchitti finished 1-2 at Belle Isle last season, and neither driver is going to be shut out forever. Built To Last: Last year’s race was marred by a crumbling road, and James Hinchcliffe’s somewhat famously going on an in-car rant about the same after a large chunk of the same ruined his day. Thankfully, the course has been renovated since then (with Hinch coming up for a few smart photo ops during the construction), and the course should be quite a bit smoother. Also of note will be the passing areas—this car has been racy even where it shouldn’t have been, so we’ll have to see if it does the trick once again. Mikey In Michigan: Mike Conway will get a turn in the Dale Coyne #18 TBA Special this weekend, bringing his street course savvy to a course where it could be very richly rewarded. Paired with Justin Wilson, who has having himself an excellent season (and has won in Detroit before), Coyne should be a blast to watch this weekend. It sounds as if the second Coyne car might do a bit of the driver carousel from this point forward in the season; if nothing else, it’s usually entertaining, sort of like a really good cameo in a TV series. Let’s hope some of the series favorites get their turn in the cockpit—and I wouldn’t mind seeing Ana Beatriz again for a big oval or two. A Seabass Century: Sebastien Bourdais is preparing to make his 100th American Open Wheel start, and it’s great to still have him around. At only 34 years of age, he should have plenty of good years ahead of him, and it would be tremendous to see what he can do with a consistent program under him. He didn’t have much luck at this track last year with his brand-new Chevy power, but hopefully #100 can net him some good results. Dragon Racing has really struggled with results this year, with both Bourdais and teammate Sebastian Saavedra out of the Top 20 in points. The Championship Points Battle: I did an article for INDYCAR Nation this week on closeness of the points battle for the season title, but to give you the summary: yes, it’s still just about anyone’s title to win or lose. Marco Andretti leads by 11 points, but Takuma Sato has looked extremely sharp on the twisties this season, as well. Meanwhile, drivers Helio Castroneves, Ryan Hunter-Reay, Scott Dixon, Justin Wilson, and others lurk, with any weekend still capable of shaking things up in a major fashion. Meanwhile, two drivers we thought would challenge for the title this year, Dario Franchitti and Will Power, sit glumly outside the Top 15, with a frankly stunning victory drought for both drivers still continuing. “Unexpected” is the new expectation in IndyCar this year, apparently. To Servia With Love: What IndyCar fan doesn’t love Oriol Servia? He’s the pro’s pro, the journeyman driver who can always be counted on to give the best performance possible in whatever circumstances. He’s also extremely hard-luck when it comes to teams. Sadly, this has extended to Dreyer and Reinbold Racing, who has punted on the rest of the season. The racing goes on, but we can’t wait to have Servia and the team back out there. Fingers crossed good things come out of this. Pole: For Race #1, I’m liking Simon Pagenaud. Just have a feeling. Winner: Oh gosh. Let’s say Scott Dixon for one, and Helio Castroneves for the other. The Ganassi and Penskes have been too quiet. It can’t last forever, right? Dark Horse: Let's go with one of the Coynes (Conway was P9 here a year ago), or possibly Charlie Kimball. Mazda Road to Indy Update: No Firestone Indy Lights, Pro Mazda, or USF2000 cars this week; we won’t see them again until Milwaukee. However, this is an excellent opportunity to show the end of the Freedom 100 yet again. Seriously, someone give Peter Dempsey a ride in next year’s Indy 500; Pure Awesomeness could be the sponsor. Don’t forget, Fantasy Picks are due Friday morning by 10 am ET! Your three drivers will count across both races, so you could either have a points bonanza this week, or get leapfrogged in short order if you choose poorly. I’m thinking we’re going to have to do a trophy or something for our eventual season winner. I'm moving this weekend, so I might be a bit scarce online, but have an great weekend, and let's see who the winners are come Monday morning. 1) Others have already waxed eloquently on just what TK’s victory meant to the fans, and I think we all have a pretty good idea that this is one of the most popular 500 victories in the history of Indianapolis Motor Speedway. Still, it was gratifying to see fans in my section become truly emotional over this victory for a driver they’ve cheered for over a decade. It was genuine emotional investment in the outcome of a race, far more than just a simple, “Oh, good for him”. That’s pretty great to see. 2) Whatever folks outside the 500 experience think of grown men and women with tears in their eyes from Jim Nabors singing, or getting emotional during a flyover or the site of cars forming into 11 rows of 3, I’m happy that there’s something out there that still causes that sort of emotion. We live in a cynical, jaded world, where items such as patriotism, tradition, and home pride are increasingly devalued and mocked. But every year, the tears flow for me during “Back Home Again in Indiana”, and I’m galvanized when I hear the “Start Your Engines” command. Looking around and seeing everyone from the elderly to burly biker guys have the same reactions, that’s a good reminder that Indy transcends modern expectations. 3) It was chilly enough in the stands early Sunday to warrant buying a hot chocolate and Brickyard Burger—both for warmth as much as taste. 4) Quick thought: Since Tony Kanaan won, is Marco Andretti the new Lloyd Ruby of this generation? Next year will be his 9th Indy 500, and few have been better or more exciting to watch over the years at IMS. I suppose you could make an argument for Ed Carpenter, though his finishes at Indy haven’t been quite as good overall. Something to think about, I suppose. These guys put on a heck of a show. 5) Speaking of Marco, in case you hadn’t noticed, he’s leading in points for the IZOD IndyCar Series title. I know Indy is huge to him, but he’s just been uniformly excellent this year. And without that Dario crash, don’t tell me you don’t see a massive four-way shootout for the win coming. I still think he’ll get his Indy win in due time, but for now, there's a great title fight afoot. 6) You also have to like what Ryan Hunter-Reay is doing. He isn’t in the points lead yet, but he’s certainly in the discussion after that performance of Indy. Plus, he’s got some tracks coming up where he’s done quite well indeed. It would seem the hope of a repeat title is very much alive and kicking. 7) Fans who watched Versus/NBC Sports a couple of years ago probably remember the “Hoodie Ninja” commercial and song. I’m fully convinced Justin Wilson and Charlie Kimball are “Honda ninjas”. You sort of lose track of how they’re doing mid-race, you aren’t paying attention, and then suddenly—POW!! !—Top 10 finish. I’m not sure how they do it, but I suspect it involves smoke pellets. 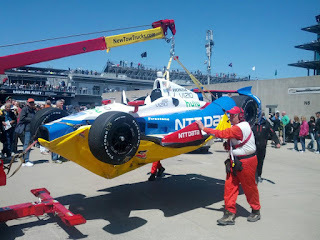 8) Honda had been at least competitive in the first four races before Indy, but Chevy grabbing spots 1-4 and not really having a Honda in serious contention for the win this past weekend has to hurt. Moving back to the twisties, I wouldn’t be surprised if Honda comes storming back, but man, did Chevy power ever go roaring to Victory Circle in a powerful way. 9) Believe it or not, but I totally missed the entire uproar over the security lines outside some of the gates. I’m usually at the track when the gates open, and was just a little bit later this year thanks to a stomach bug that wouldn’t go away. I understand that folks who arrived later on in the morning had delays, especially those arriving in the last hour. IMS has apologized, and hopefully next year goes a bit smoother. That said, avoid lines, traffic, and the joy of easy access are two of the big reasons I camp across the street. 10) Speaking of camping, I’d really like to see some more family areas for camping. That’s probably a tall order, given how the campsites are laid out, but I was in Lot 2 this year (a more sedate lot by reputation versus the Coke Lot), and I still saw enough to guarantee I would never take my kids tent camping there on race weekend. Honestly, Lot 3, which I believe is supposed to be family-oriented, isn’t much better. That’s probably a losing battle, and I’ll just have to look for another solution. 11) Getting to interview Marco Andretti, Buddy Lazier, Ryan Hunter-Reay, EJ Viso, and others is amazing. Whether you’ve got a ticket for practice, a bronze badge, or a media credential (and I’ve done all three in my time at Indy), you aren’t going to leave without getting to interact with drivers if you want to. My daughter was able to see all her favorites this month, and that’s pretty special, I think. 12) I really thought at several points during the month Carlos Muñoz would have a rookie “moment” and lose it in the turn. His line was a bit iffy at points leading up to the race, but he certainly proved himself amply this past Sunday. He was patient when he needed to be patient, aggressive when he could be aggressive, and looked like a veteran for 200 laps. He has a bright future in INDYCAR, I think. 13) For the record, Muñoz still has a 27-point title lead in Firestone Indy Lights after last Friday’s Freedom 100, though Peter Dempsey did a nice job of jumping to P2 after his insanely exciting, last-second victory. We won’t see Lights again until the Milwaukee Mile in a few weeks, but I am really excited to see how Muñoz and Dempsey mix it up with guys like Sage Karam and Gaby Chaves the rest of this season. I truly believe all of them are or will eventually be next-level talents. 14) Keeping with Mazda Road to Indy news for a moment, congrats to Neil Alberico and Matthew Brabham for their Night Before The 500 victories. Matty Brabs is opening up a big lead in Star Mazda competition, while Alberico (and all his peers) have plenty of work to do to erase Scott Hargrove’s still-demanding lead in USF2000. Also, it’s great to see “The Viking” Anders Krohn back in an open wheel car again, even though I’d much prefer it be a Firestone Indy Lights program (or even a shot in the big cars). 15) I want to give a huge thanks to my fellow blogger and social media fan types for a great month. Seriously, most of us exist in a wasteland of racing conversation for 11 months out of the year in our homes and workplaces. Talking shop and racing, without any of the meta angst, was hugely enjoyable. It’s great to see people writing and participating not because they want some form of micro-celebrity or recognition, but for the simple, pure love of INDYCAR and the 500. To the crowd watching quals from the inside of Turn 1, that was the best. BSing over the 500 and trying to guess what drivers will do on their qual runs beats just about anything else. 16) Huge cheers to Ana Beatriz; she fought through some tough portions of the race to be Sunday’s biggest mover on the day and net her all-time best finish at Indy. +14 positions in a race like that is nothing to sneeze at. 17) I largely avoided the idiocy of the knee-jerk calls for Green-White-Checkered finishes after Sunday, but I’ll just say this: there is almost nothing that would make me stop following INDYCAR. Incorporating the G-W-C would very likely do the trick. 18) Moving on from that unpleasantness, getting to see a team throw together a last-minute effort as Lazier Partners Racing did was really cool. I sincerely hope that the Lazier crew makes Indy an annual obligation—and I’d love to see them get something together for Texas or Pocono later this season. It figured they’d have mechanical issues with as little time as they had with the car, but I still came away impressed overall. Let’s see what they can do with a proper ramp-up. 19) A.J. Allmendinger is not only one heck of a driver (and probably the 500 Rookie of the Year in just about any other year), but he’s funny, occasionally self-deprecating, and a fun addition to the lineup. If he keeps adding races, I think he can finish Top 20 in points, even if he misses a couple of rounds. For now, I’m looking forward to what he can do at Detroit. He definitely belongs in open wheel racing. 20) Overheard in the camping lot this past weekend: “It’s our first 500! We have great seats—all the way at the bottom” (they were sitting in a turn). It’s an experience thing. If your regular bill of fare is baseball and football games, that probably seems like a good deal. They probably figured it out in pretty short order when the green flag flew. 21) How disappointing was JR Hildebrand’s early out? I really thought this might be a big year, a resurgent year, for Panther Racing, but both Hildebrand and Townsend Bell ran into issues that ruined their race. For Hildebrand, leading at the white flag in 2011 seems pretty far removed right now. I hope he grabs a good result in the next few races. The series would benefit from him going on a nice, competitive run. 22) I really think Simon Pagenaud is getting back to the form that wowed so many of us last year when he was a rookie. Since St. Pete, we’ve seen all Top 10s, but after last year, I think we all expect a podium or two by this point in the season. There’s still plenty of racing to be had, though, and I still think we’ll see plenty of good things from him on ovals and street courses alike. 23) IMS should have a chili dog stand inside the grounds. A dedicated chili dog stand, where the focus is just chili dogs. Tenderloins and soft pretzels have their place, but I think a specialty hot dog/chili dog vendor would be aces. 24) Being a fan is cool. Being creepy and following a driver or drivers around to excess is not. I saw several examples of the latter this month. There will always be creeps, be it at IMS or elsewhere. Courtesy is a great thing, as is not obsessing over a driver to the point of discomfort. Some fans just don’t get it. 25) Looking back at the month, it isn’t just one thing that really makes the month special. It’s the accessibility of drivers like EJ Viso and Pippa Mann, who don’t have to be as friendly and pleasant as they are, especially when they’re under pressure, but do it anyway. It’s getting to listen to Bobby Unser turn a question about the weather into a 30-minute monologue about the 1970s. It’s getting to hang out with my buddies old and new, who spend every minute at the track that they can because they get it. It’s getting to see little sneak peeks of what we can expect with Turbo. It’s the first and last pork tenderloins of the month (ok, and all the tenderloins in the middle). It’s seeing the fans’ champion, Tony Kanaan, finally get it done. It’s Peter Dempsey and Belardi, Alex Tagliani and Team Barracuda. It’s sharing what you love with others. It’s tuning out the bad for the good kind. It’s knowing that we just went through another 500, and know even a bit more now of what Indy means to each of us. Is it (next) May yet? If you're anything like me, you woke up this morning tired, a bit sunburned, sore, but still euphoric over what we witnessed yesterday. I wrote the other day about always having hope at Indy. Every generation at the Speedway has a driver the crowd is always hopeful will win. There's Lloyd Ruby, who ran so well in the 60s and 70s, only to never take the checkered flag. In the 80s and 90s, it was Michael Andretti, who came agonizingly close, only to ultimately be denied, despite getting so close. There have been others, for other generations, from Ted Horn and Rex Mays in the 30s and 40s, to members of the Bettenhausen family, fans can mark many who never got that lucky breaak. For many in my generation, until yesterday, that same descriptor applied to Tony Kanaan. He led in eight different 500s before this race, but never had either the car, strategy, or plain luck to win. At 38 years of age, on a team that had not won in the current incarnation of this open wheel series, the window appeared to be closing on Kanaan. Yet, on a day where the old record for lead changes was obliterated, where drivers like Ryan Hunter-Reay, Marco Andretti, A.J. Allmendinger, and Carlos Munoz all seemingly had cars to win, Tony Kanaan took the lead at the end, when it mattered. In prior years, you get the sense he'd have been caught in the wrong place at the wrong time by the last caution flag. But his fate was different this time around. The fans? They've always loved Kanaan, and he routinely gets the biggest cheers in pre-race introductions. This year was no different, and after the race, many more than usual stuck around for the post-race celebration. It was as popular a win as we've seen, and it went to a driver that has shown so much love and effort towards Indy. TK said when interviewed after the race that it was "for the fans", and that certainly seemed to bear out in their reactions. At long last, the hard-luck guy they'd cheered so hard for gained his place on the Borg-Warner Trophy. Today, Tony Kanaan will do countless interviews, take tons of publicity photos, and probably pinch himself quite a few times to assure himself it wasn't a dream. One also has to suspect that a great many "Greatest 33" lists pertaining to Indianapolis drivers have been updated after yesterday. It was a 500 to remember, not just for the closeness of the racing, but for the 500 champion it created. The radar forecast has, as always, been of more concern to me the past week than in the other 51 weeks of the year combined. We were told it might rain during the race, it might not, we could be hit with a deluge in the morning, or a pop-up shower in the afternoon. Even now, I'm not fully sure what the day holds. If it rains, well, Indy has been hit with rain before on race day, and will again. We'll get through it. Rain or shine, this has been another amazing month at Indianapolis. I don't think I could ever feel less than privileged to spend time here, and I'm so grateful for the opportunities I've had. When I started my site just a few years ago, I never would have thought I'd be able to interview drivers, walk the pits, or get even a hint of what goes on behind the scenes. There's not a day goes by that I don't love being out here. Going back even further, before IndyCar Advocate began, and I was just a homesick new dad deployed overseas, missing his family and home very much, there were times when it seemed like I'd never make it back here, that I'd never see this place again. There were Memorial Day weekends spend trying to follow the race on Armed Forces television, with a reception that was more snow than race. So why am I spilling my guts on race morning? Perhaps because this is a weekend to think about those who didn't make it home, who didn't get to live out a dream. Perhaps it's simply because I continue to be able to do something I love, and I immensely mindful of that this morning. Perhaps it's because it's very easy to see those who have forgotten just a bit of what makes this special, and how fortunate we are to do what we do. I thank all of you for giving me a chance to follow this dream by reading what I write, and allowing me to share in turn with you. This is the best time of the day at Indy. The incredible cacophony from the night before has quieted down, and there's just the early morning expectancy, of the dark slowly fading into the first few colors of light, and the Pagoda, standing as a beacon for all race fans. It's a time of hope, a hope that renews every race morning every year, no matter how often our favorite hits the Turn 4 wall, no matter how many times the guy who really loves this place falls just short, or the race doesn't go just as we'd hoped. I know sometimes that my IndyCar thoughts are seen as overly optimistic, or always glass half full, but there's a very good reason for that. I genuinely love every minute of this. I can't fathom being a part of a culture of negativity. And just like race mornings, there's always hope. Even when there's the threat of rain on race day, you can complain and shake your fist at the clouds, or you can grab an umbrella and go out to enjoy what you love. That probably seems a bit short of profound, and I'll admit, profundity is probably a skill in which I am easily surpassed. But really, I think my advice for today, or any race day, is this: you only get so many Indy 500s, and so many IndyCar races. Spend them appreciating what you have, and the fact that an awful lot of people never got the chance to be in your seat, whether it's in J-Stand, Tower Terrace, or on the sofa at home. IndyCar is the best racing on the planet right now. We've had an incredible season, and whether or not your favorite driver wins, all signs point to another great race today. However it unfolds, from a brand-new champion to even a rain delay, I'll be grateful, honored, and thrilled to spend another Memorial Day Weekend at the Greatest Race Course in the World. My 8 year-old daughter Saris is a budding IndyCar fan, and earlier, she provided us with her INDYCAR season preview. Today, we share another Q&A, in which she shares her thoughts on this year's Indy 500. OK, Saris, it's close to bedtime while we're writing this, so let's make it quick. What was the biggest surprise for you on either Pole Day or Bump Day? Saris: No Hondas in the Top 9. I thought we would see one. Did you expect to see Sato leading the championship race coming into Indy? Saris: If Sato wins the championship, it will have to be a family holiday! I didn't expect him to see him leading the points, because he had never won a race in IndyCar coming into this season. Can he win Indy this year? What about the Honda engines? Saris: That's not as important as pit crew and not crashing. Which driver winning would get the biggest cheers in our house? Saris: Well, Lilly and I want Pippa. Mommy wants Will Power to win, because she has a driver crush and everybody knows it. Yeah, we covered that last time. Your brother would want Scott Dixon, I suppose. What was the best part of going to the track this year for you? Saris: Seeing all the drivers, like JR Hildebrand and Josef Newgarden. What's the best-looking car in this year's 500? Saris: I really like the Turbo car that Townsend Bell has! Me, too. What are the best colors for an Indy 500 car design, if you were sponsoring a car? Saris: Red, black, and white. Like Will Power's car, or something different? Saris: Something different. Like, a different company, with red, blue, black, and white. You have totally lost me. Are you adding colors? Saris: I don't know. I'll have to read what I wrote later. So what number would you run, and why? Saris: 24, because I just like that number. OK, time to make the big prediction. Who will win this race, and why? Saris: Hinch. He's won twice this year. Yeah, but street courses are different from ovals. Saris: Well, I'M SURE HE'S FIGURED THAT OUT. Har. OK, well, then who's your Super-Secret Underdog Pick? Saris: Oriol Servia. Or maybe Graham Rahal. You think Graham can pull it off? Saris: I think so. He's a Rahal. What would be your words of advice for all the rookies in this field making their first 500 start? Saris: Well, besides not crashing, I'd say go fast, have the best pit crew, and finish in front of everyone else. Should I tell Roger Penske you're looking for work? You'd make a heck of a race strategist. It's someone who figures out how a race should go. Is this year's race going to be as good as last year's race? Saris: I think this year is better, because it's quite a competition! Plus, this year, I know more about what's going on, which helps. Anything you want to say to the fans or drivers before we close this out? Saris: For the fans, yell loud! For the drivers, behave and watch your mouth on the radio. Good advice. I'm sure one of those groups will follow it. Enjoy the race, daughter! Saris: I'm serious. Those drivers better follow it, or they've got something coming. OK, Mini-Barfield. We're done here. Greetings from Carb Day, where I just witnessed the most exciting finish in Firestone Indy Lights history. That's not hyperbole. Coming from fourth place on the last lap, Ireland's Peter Dempsey of Belardi Auto Racing joined a 4-wide melee that also included Sage Karam, Carlos Munoz, and Gaby Chaves. It looked as if Chaves had it, but Dempsey--in what would be the closest finish in Lights history--won by a mere .002 of second. In the most high-profile race of the year, Firestone Indy Lights came through, in a huge way. And it was so fitting that Peter Demspey should win the race. Few drivers have had the stamina to go through as much career drama as Dempsey has, moving from team to team, subsisting on part-time deals and "almosts" for a long time. When it counted, however, he made the run, and it's one that will be replayed and featured countless time by racing fans. The fans here at the Indianapolis Motor Speedway absolutely loved it, I can tell you that. Also, congrats to the Lights drivers for giving us a very clean race. Earlier today, Simon Pagenaud grabbed the fastest Carb Day speed, with a nice mix of Chevys and Hondas at the top. As always, it's smart not to read too much into practice speed--we'll see who has it for the long run on Sunday. Speaking of, if you missed it, be sure check out my interview with Lazier that was featured this morning. That's it from Carb Day for now, but there will be plenty more to come this weekend. The sun is shining in Indy, the weather perfect, and everything seems to be leading up to another great Indy 500. Starting from Row 11 on Sunday, 1996 Indianapolis 500 winner Buddy Lazier won't be content to stay there, if he has anything to say about it. "Of course, you're in it to win it always when you race," affirmed Lazier while surrounded by members of the press during the Indy 500's Media Day. "There have been so many times here where we coulda-woulda-shoulda won it, finishing second twice. I'll know right away if I've got that kind of car." It's a story that begun back in 1989, when Lazier tried to qualify for his first Indy 500. It will see another chapter written this weekend, as the 45 year-old driver makes his return to a race he last competed in back in 2008. This start, his 17th at Indy, will give him an appearance or attempt at the 500 in four different decades, a rare feat shared only by a handful of drivers with names such as A.J. Foyt (who drove in 5 different decades), Mario Andretti, Gordon Johncock, and Gary Bettenhausen. Despite the variations and changes in racing during that time frame, Lazier was very complimentary towards the current DW12 chassis. Lazier will start his 17th Indy 500 on Sunday from P32. Courtesy IndyCar Media. Photo by Chris Jones. "I love it," Lazier enthused. "It reminds me, actually, of the Lola/Reynard era, which was a good one for me. I think that sort of helped me adapt. There's still a lot of weight--a lot of rear weight in this car, so that's sort of an engineering conundrum we're still trying to solve." Still, it isn't just longevity that Lazier is after on Sunday. It's speed, too. The program he built with his father Bob (an accomplished racer in his own day), Lazier Partners Racing, will be sporting Chevy power under the cowling of their #91 Advance Auto Parts machine. "Every time we've attacked the car to find a little more speed, it's come up," said Lazier. "It's a great car." Lazier also feels fortunate to have Chevy power, admitting going with the Bowtie brand has been a plus. "No question about it, I've been as fortunate as can be to have Chevy," Lazier confirmed. "Nothing against Honda--they're both great motors, but I've been incredibly happy with my motor, for sure. It's incredible what it'll do. The last time we had turbochargers, you'd get maximum boost at the end of the straightaway, then it would hiss in your ear and you'd have to adjust your wastegastes manually. Now, it's automatically adjusting, so you've got the max everywhere." Pleased as he is, Lazier also knows that things don't always go a driver or team's way at Indianapolis. "When it comes to this place, the cream of the cars will always rise to the front," stated Lazier. "If we've hit it right on setup, we'll go to the front. If not, I'll make the best of it." Lazier will have a new livery for the 500. In most eyes, Lazier has done enough to make his 500 legacy secure. But after failing to qualify in his last attempt at Indy in 2009, he knew that's not how he wanted to leave things. "I never felt comfortable with where we left it," admitted Lazier. "I was very unhappy with the way it was left. You can imagine, if it haunts me having a car that should have won that didn't win, how it haunts you when you have a car that just wasn't fast enough. The way we left it, it had been eating at me, for sure. It felt good to come back--but added a lot of pressure to really only have one day of practice. We had to get a lot done in short amount of time, so that goes into it. We really only had two weeks' notice, and had to act fast just to get everything assembled. Now, that's behind us, and we're looking ahead, and hopefully using experience to get where we want to be." 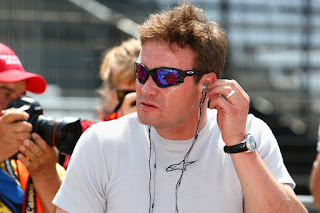 He also confirmed Lazier Partners Racing was working to make their entry at Indianapolis an annual one, which could mean more opportunities for Buddy Lazier to return to the Indianapolis 500 in the years to come. So why is this race worth watching? Because it is, to put it succinctly, alternately terrifying and thrilling. I usually have to watch through my fingers during some portions. Not all of the Lights drivers are overly familiar with terms like "restraint", "normal racing line", or "patience". That's not to say it's some bloody demolition derby (always), but it is an aggressive, wild race of 40 laps. When people talk about drivers "just going for it", they're talking about the kind of knife fight as we'll see Friday. But I don't normally follow Firestone Indy Lights too closely. Doesn't matter. This is a great tune-up for the Indy 500, my amigo/a. These cars still put on a heck of a show, and it's more a refresher/appetizer than it is a longer-style race. If the 500 is a steak dinner at an Americana restaurant chain, this is the mozzarella cheese sticks sampler beforehand. We're talking no pitting for fuel, speeds of over 190 mph--still faster than NASCAR on this same track. If you're going to watch a Lights race, this is the one. But I've been ensured this year's Firestone Indy Lights field is dismal and possibly carcinogenic by no less than five internet experts! It's true, there aren't a lot of entries this year, but there are a lot of really interesting drivers with some real talent. I hate to do the whole quality/quantity thing, but a nice number of the full-time Lights drivers this year have at least the potential to develop into solid drivers at the next level. There's Lights rookie Sage Karam, a young American who's excellent on ovals and jumped to Sam Schmidt Motorsports' program after time in the Andretti ladder system. There's also British driver Jack Hawksworth, who is usually as smooth as they come (though he's still getting his oval legs under him). Ireland's Peter Dempsey is a very well-regarded prospect, as is Colombian-American driver Gaby Chaves. Perhaps most notable is Carlos Munoz, who you will also see in the front row of this weekend's Indy 500. As one of Andretti's Firestone Indy Lights drivers, he's pulling double-duty at IMS this month. Any current/recent IndyCar drivers ever win the 100? Oh yes. Ed Carpenter, Wade Cunningham (3 times! ), and Josef Newgarden all won this race in their time. Plus, we just mentioned Carlos Munoz, a current driver racing in both the big and little IMS race this month. 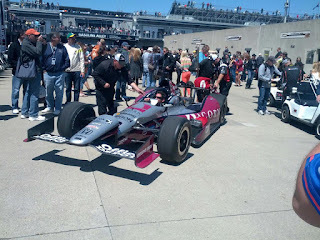 Plenty of other current IndyCar drivers also took their turn racing in this event, too, including Pippa Mann, who won the the pole for the race back in 2010. So, how do they qualify? These qualify the day before the Freedom 100 (today, if you're reading this Thursday), and it's based on two laps of qualifying, not four like the Indy 500. If you're heading out to the track today, Lights quals should start at 1:15pm local. OK, I'm a local Indy-type person. Give me a good story to follow for the race. Here's one: Kyle O'Gara. Sarah Fisher's young brother-in-law is a Roncalli High School student who usually runs USAC midgets. He's competing in this year's Freedom 100, and all of his classmates will get to see him race, courtesy of sponsor SportsEvents.com. Away with your human interest angle, you softie! I want to make a winning bet here! My prediction is either Munoz or Karam to pull out the win, but the race usually sees some early carnage that changes everything. I wouldn't bet on the Firestone 100 with a wooden nickel; it's that unpredictable, usually. Am I allowed to punch that obnoxious hipster in the faux-white trash outfit slamming back PBRs square in his stupid face? You'd better not. You'll be outnumbered pretty heavily. Just realize that there are some, ahem, "non-traditional" fans in attendance on Carb Day. Just grin and bear it--the Firestone Freedom 100 is usually well worth the hassle, and with the seating pretty open, you can always migrate to a better vantage point. Today marks the second installment of a preview of this year’s starting 33 drivers for the Indianapolis 500. If you missed yesterday’s preview, which covered Rows 1-5, you can find it here. It doesn’t matter if the Ganassi cars qualify in Row 1, Row 6, or Row 10; they still have to be accounted for on race day. While the Hondas seem to lack the raw power of the Chevy camp this year, Scott Dixon is one of the all-time best at Indianapolis, and can never be counted out. As always, he should run well, run smart, and could very easily take his string of Top 6 Indy 500 finishes into its eighth year. Qualifying positions are nice and all, but the Ganassi garage knows how to make a car balanced, quick, and sustainable in race trim. The 2008 winner should again be a contender up front again this year. While some fans grumbled of “winner fatigue” after the now three-time 500 winner won again last year, there’s no doubting Franchitti is simply on another level when it comes to Indy. Like his teammate Dixon, it would be folly to think he couldn’t win, regardless of what we’ve seen from Chevy or Honda so far this month. We should expect him towards the front on race day in relatively short order. If he does win his fourth 500 this Sunday, it will be very interesting to see how the crowd reacts. It’s also interesting to note he’s starting next to Sato, whom he battled on the infamous last lap of last year’s race. It could be a wild start in Row 6. Everyone, and I mean everyone, with even a tangential interest in IndyCar and the Indy 500, has seen the last-lap crash as Sato attempted to push past Dario Franchitti to win the 500 last year. It was a gutsy, ill-starred move, the kind we’ve come to expect from Sato. This year, however, rather than crash out, Taku has the Foyt team leading the series in points heading into Indianapolis. Sato is still a very aggressive driver, which can mean a feast-or-famine outcome at IMS. He’s driven smarter this year overall, though, and I think everyone is essentially just waiting to see if he can duplicate his late-race fireworks again this year, only with a happier outcome. Of all the Honda entries, Sato may well be the biggest wild card in terms of just what he’ll do. If he leaves Indy with a good finish and the season points lead still intact, it will be huge. Kimball is the quiet Everyman of IndyCar, seemingly sneaking in for a Top 10 or even podium here and there. Despite driving for Ganassi, he rarely gets mentioned as being seriously in contention, even as he’s cracked the Top 10 in points so far this season. We’ll have to wait and see what the team and engine brings for race day, but Kimball did finish P8 in last year’s race. If he ninjas the field and ends up with a Top 5 finish, don’t say you weren't warned. It appeared as if Jakes was struggling along with the rest of the RLLR on Pole Day, when he busted off a late run that turned out to be more than enough to make it into the field. Jakes had a competent, mid-pack finish last year after missing the 2011 race, but it’s tough to know just what to expect from one of IndyCar’s less-known drivers this weekend (forgive me, Jakesy Nation). He’s raced reasonably well not only at Indy, but also Fontana and Texas, so a result just outside the Top 10 (or perhaps just sneaking in) is not too remote a possibility. With the chaotic month RLLR has had, nothing would really surprise me here. Pags may have had a superb rookie season, but this year hasn’t been one to remember thus far. We’ve seen him run well on big ovals before, and he should have a chance at a positive result come this Sunday. I’d expect him to not be overly aggressive, run a smart race, and take what opportunities he can to move up. It might be easy to overlook Pags given the amount of oval talent on display in this field, but that should not be the case. He’s very capable of having a great day at IMS this weekend. Bell has been fortunate enough to drive the Sunoco “Turbo” car this month, which is at least in the conversation for the very best livery out there. Appearances don’t count for much once the race starts, but fortunately Bell has looked pretty quick all month. The Pole Day time withdrawal/re-qualification silliness behind him, Bell would seem to be in a great position to grab another Top 10 result at Indianapolis. Last year’s Indy 500 polesitter has had an awful lot happen since then. He was released from Penske Racing after the season, didn’t find a full-time IndyCar driving gig that worked for him, and finally agreed to a one-off deal for Indianapolis. Briscoe didn’t qualify particularly well, but he has plenty of experience at Indy, and that and keeping patient counts for much more on race day. It’d be a great story if Briscoe could storm back and win Indy this year, even if that looks like a somewhat longer bet right now compared to last season. A year after the Great Lotus Crisis of 2012 saw Simona run a handful of slow laps before retiring from the race, the Iron Maiden is back, this time with a competitive car and a team that should be at least solid for the 500. It has to feel much better for de Silvestro, who’s had a brutal time of it at it after winning Rookie of the Year honors back in 2010. De Silvestro’s never been considered a prime oval racer, but she could creep up a few positions over the course of the race. Something around a Top 10 for her here would be nothing short of excellent, and a great bit of redemption, to boot. Newgarden simply ran out of time on Pole Day to qualify, but the team has been one of the more impressive Honda teams this month, despite being a smaller one-car effort. Newgarden was extremely fast in practice and qualifications in his rookie 500 last year, but the team ran into all manner of mechanical race day woes. Last season, it was a P25 result after starting P7. This year, starting P25, can they manage a P7 or better? Newgarden and SFHR have the ability to run well here, and have to be counted as not only a sort of Honda bellwether, but one of the more intriguing entries in the back half of the field. Rahal’s month was absolutely brutal, as for most of the month the Rahal Letterman Lanigan crew simply could not find speed. The crew was able to make it happen on Bump Day at over 225 mph, and now they can worry about race setup. The last time Graham started towards the back at Indy was 2011 (P30) and he finished third, so it isn’t as if he can’t make the charge forward on race day. After a rough month, Rahal knows that what really matters is getting it right when the flag drops Sunday. He's still very much in the race day conversation. Saavedra will be making his third Indy 500 start Sunday, though neither previous start was exactly sparkling in nature. Saavedra has Chevy power behind him, but seemed a bit up-and-down this month, culminating in a Bump Day practice moment that almost took out polesitter Ed Carpenter. Dragon Racing hasn’t had a particularly good year, so improving on his previous finishes and moving up as he can without incident would indicate nice progress for driver and team alike. The likable rookie didn’t look fully at-ease during his first time in the big cars at Indy, and perhaps that’s good; you never want drivers to be too “comfortable” with things. Vautier managed to keep things green all month through qualifications, and finishing the race likewise has to be a main goal. Folks expect big things from Vautier as he gains experience; a respectable, confident finish at Indianapolis would be an excellent next chapter in his story. Leading up to qualifications, Beatriz was relatively slow on the speed charts, and did seem happy or comfortable with where her cars was. By the time qualifications came around, however, she was able to find plenty of speed to qualify comfortably—and probably had a bit more, had she needed it. In her three previous 500s, she’s never finished higher than P21, so it might be a bit much to expect anything at the front of the pack this year. Mann made her debut in the DW12 car on INDYCAR’s biggest stage in Indianapolis, and acquitted herself nicely, having no real issues during the month. Like her teammate Bia, you got the sense that there was a bit more speed in the car if it came down to that. Mann’s rookie 500 odyssey two years ago ended with her finishing P20 (+11 spots on the day) with a broken hydration system; she’ll look to improve on that this time around. Folks have questioned just how competitive the 2nd and 3rd Coyne entries can be; Mann and Beatriz will help answer that Sunday. After a rookie May that included a nasty accident, plus engine swap following an aborted qualifying run, the Noblesville, Indiana hometown kid managed to find speed on Bump Day and put his car into the field. Daly seemed a bit shaky at points during the month, and that’s understandable; Indy can bite hard. With all that behind him, he’ll look to stay out of trouble and turn his first 500 experience into a more positive one. Daly has plenty of talent and is an easy guy to cheer for; let’s hope his race day is clean and clear. A sizable number of individuals figured the 1996 Indy 500 winner would be the odd man out come Bump Day, given the fact his team had no backup car, a last-minute deal, and not a lot of support network. Yet the Lazier crew, bringing together a mix of Hemelgarn and Conquest crew, managed to make the show, and seemed to have more speed had they needed it. (Having Chevy power was certainly a boon, as well). It’s easy to speculate perhaps Lazier’s car won’t stand up to the rigors of 500 miles, but historically, Buddy’s been pretty good about moving up from the back of the field over his long career at Indianapolis. A Top 15 finish or higher for this team would be a big feather in the hat, and a nice story to round out the month. A last-minute addition to the 500 field, Legge was able to qualify with minimal laps in the car, getting up to speed very quickly on Bump Day. Making her second 500 start, even Legge has few pretensions about her chances of winning, stating after Bump Day that a Top 10 would be a pretty great scenario for this entry. She raced well at Fontana in last year’s finale, and she should at least be able to move up a few spots if her equipment is serviceable. We’ve seen small teams win pole position at Indianapolis before, such as Sam Schmidt’s crew with Alex Tagliani in 2011. However, Ed Carpenter’s crew has every reason to believe that their storybook month will not end there. Carpenter won the most recent IndyCar oval race (Fontana, in last year’s finale), and he was in contention for the win at Indy before a late incident last year. While his overall Indy stats might not look legendary, he’s run especially well here overall in recent years, and this team is built to win on ovals. There’s no guarantee Carpenter drinks the milk Sunday, but his performance this month is anything but a fluke. The young Colombian driver was fast out of the box this month, but also ran aggressively and had a few close calls that could have made his first Month of May experience much less pleasurable. The trick will be to see if Muñoz can temper his raw speed with patience and good decision-making to ensure he hangs around for the final stages of the race. As the only driver doing both the 500 and the Firestone Indy Lights Freedom 100 race, Muñoz has had no shortage of track time at 16th and Georgetown this month. May couldn’t have gone much better for Carlos so far; we’ll see if he can finish strong and add a 500 Rookie of the Year trophy to his case. Despite the bugaboo of the “Andretti Curse”, Marco has been a popular pick to finally get his Indy 500 victory and turn around the family fortunes at this track. And why not? He’s raced extremely well this year, been fast all month at Indy, and has Chevy power behind him. Perhaps most importantly, though, is the fact that the Marco we’ve encountered this month seems more level and accepting of where he is. It seems to be a different mental outlook for Andretti, and at a track where’s he’s been so close to victory, that could make all the difference. Anyone spending five minutes with Marco can tell how much he wants this, and he should have every chance to make it happen. A New Marco This Month? Viso’s had an excellent year since moving to the Andretti Autosport stable, and this month has been no exception. The maturation process that picked up a few years ago seems to be reaching the next level. While there are those that still base their expectations of him on what he did three or four years ago, that’s not the same driver that’s starting inside Row 2 on Sunday. This will mark Viso’s best starting position at Indy; last year’s P9 start yielded P18 (his best 500 finish). Indy hasn’t been one of his better tracks, but he’s got every advantage to turn that around this year. Can Viso shake some of his remaining naysayers? We’ll soon have our answer. Dinger has been absolutely impressive in his first go-around at Indianapolis, as the NASCAR and open wheel veteran was a threat for the pole from seemingly the get-go. Then again, getting to make your rookie Indy debut with Team Penske can do a lot to smooth your path. Penske ride or no, the fact remains AJ is a very talented racer in just about anything he drives, and he should be lots of fun to watch this weekend. A Top 5 result is definitely not out of the question. This is an important race for Will Power, if he wants any chance of jumping back into the IZOD IndyCar Series title hunt. In a tie for P18 in points, Will needs to get back to his 2009-2010 finishes (average P6.5) instead of 2011-2012 (average P21). Power had a slight brush with the wall on Bump Day, but that shouldn’t have any impact on race day for him. Will was the fastest entrant for a good portion of the month, but as always, we’ll have to see how that translates into sustained race pace. Much like his 2012 title rival Will Power, Hunter-Reay has had an up-and-down history at Indianapolis. Since finishing P6 as a rookie, he’s finished no better than P18 in his next four attempts. Still, Hunter-Reay showed not only speed, but plenty of patience on ovals post-Indy last season, and he’s developed into one of the best all-around racers in the series. If RHR can channel some of the patience and decision-making he showing in the second half of last year, he should be in much better shape late in this year’s 500. We come to the first of our Indy 500 champs in this field, with Castroneves looking to become only the fourth driver to win the 500 four times. Helio didn’t blow us away with raw speed this month, the way he has in some previous years at Indy, but he’s been consistently quick and has had no shortage of time to work on some extended race runs. As much as fans love an underdog and/or new winner, it’s hard to imagine another victory by Helio being met with much unhappiness from the fans. Let’s not forget, he’s also in a very close battle for his first-ever INDYCAR season championship, and there’s no reason to think he couldn’t pick up some big points here. Hinch couldn’t quite match last year’s thrilling qualifying effort, but the Mayor once again found himself in the Fast 9 at Indianapolis. Hinch has two victories this year, but also has two DNFs through the early street/road portion of the schedule. Hinch finished P6 at Indy last year, and is part of a robust Andretti team that can boast any number of contenders. A Hinch win would probably mean plenty of GoDaddy-fueled publicity, and would also so be an immensely popular win with fans. He might not be quite the plurality pick to win that Marco is, but he certainly can't be discounted, either. What a strange couple of years for Hildebrand at Indianapolis! He comes within a quarter-mile of winning the Indianapolis 500 as a rookie, only to see the much-vaunted Panther team qualify mid-pack and finish a quiet P14 on the day. Panther has been so excellent at Indy for so long, it was strange to see them struggle a bit, even if 2012 did mean a new car to develop. Still, the team looks fully on-target this year, just missing out on the Fast 9 and looking very sharp throughout the Month of May so far. Hildebrand could very well have a very good day in his third 500. Tag definitely knows how to qualify in a hurry at Indy, and he does in fact represent the fastest Honda driver in this year’s field. Team Barracuda-BHA seemed pretty focused on getting race setup down solid, and a nice result here should definitely perk up a season that’s been disappointing for a team that was so quick in the second half of last season. Tag has finished between P10-P12 in three of his four races at Indy, so around a Top 10 finish Sunday would very easily in line with his history here. The perpetual Indy fan favorite, Kanaan is firmly into Lloyd Ruby territory at this point in his Indy 500 career. He’s an annual contender who just never quite has the car or the luck to make it happen. While he hopefully still has a nice number of 500 starts ahead of him, the clock is still ticking on getting a victory that would mean so very much to both Kanaan and the IMS fans. Kanaan’s KV machine doesn’t quite seem to have the speed of the Andretti or Penske Chevys, but he knows how to get around the track, and should make it exciting, if nothing else. If TK is battling it out for the lead in the closing laps, expect the Speedway crowd to completely lose it—yet again. With Dreyer and Reinbold Racing likely temporarily shuttering their IndyCar operation after the 500, veteran Servia finds his career prospects much as they have been most of his career--up in the air. The team has not let adversity bother them this month, and Servia has looked very solid through practice and qualifications. Servia has finished P6 and P4 in his last two 500s, and has seemed to really find a new level of performance when it comes to the Greatest Spectacle in Racing. If he can pull together a win--which is not totally out of the realm of possibility--it would be a wonderful story and building block for a long-time team and great driver that have had some bad breaks. Wilson has shown a proclivity for doing well on big ovals in the DW12 car. He won last year in a stunner at Texas, but even more relevant to this week's discussion, he finished a strong P7 in last year's Indy 500. A top-notch driver who gets the best out of his equipment, Wilson is more than capable of another prime run in this year's race. When the car makes the driver truly drive, that's when he's at his best. Consider him a dark horse to make things quite interesting in the final few laps, but he should at least have a good opportunity for another good Indy result. Every time I passed Bourdais this month, be it in the garages or pits, he had a rather pleased (and occasionally downright happy) expression on his face. While Dragon's season has been dismal thus far, Bourdais qualified pretty well, showed a nice amount of speed in practice, and seems very confident going into Sunday's race. While neither of his prior runs at Indianapolis were anything special, it wouldn't be too shocking to see him moving up over the course of the race come Sunday. If nothing else, the the glare chrome design of his McAfee car could blind his competition, but somehow I don't think he'll need that sort of edge to do well. Check back tomorrow for Part 2 of the Indy 500 Field Preview. -We have to start with our polesitter, Ed Carpenter. It looked like the first couple of rows would be an all-Penske/Andretti affair, but by staying the course on setup from the morning practice, Carpenter was able to reel off two laps in excess of 229 mph and make it happen. It's a great story, but Ed should again be in contention to win the 500. After Pole Day concluded, he was saying all the right things about ensuring starting P1 didn't ruin the team's focus on that goal. As one of the prime oval drivers in the series over the past few years, Ed definitely has a realistic change at the Borg-Warner next Sunday. -So what of the rather obvious discrepancy in qualifying speeds between the Chevy and Honda teams? While it's definitely a feather in the hat for Chevy to dominate qualifying in such a definitive manner, things could be completely different once teams get their race setups complete. Stability, sustained speed, and plenty of opportunities to pass mean we could very well see a Honda win, just as much as a Chevy. That said, those first 3-4 rows certainly look formidable right now, don't they? -Perhaps my favorite row of the race has to be Row 6. That's Scott Dixon, Dario Franchitti, and Takuma Sato starting next to one another. That could be a very interesting first few laps, couldn't it? -I'm still scratching my head over the Pole Day decision to send Townsend Bell back out for a second attempt after he had already comfortably qualified. That led to a failed attempt, and Bell having to use his third and final attempt to bump himself back in, albeit at the cost of a position from his earlier attempt. I didn't see it coming, and I'm still not sure I get the logic. -There are so many great stories to cover, but how about Simona de Silvestro back as a Pole Day qualifier? That had to feel really, really good after last year's Lotus crisis. Simona's usually been mid-pack at Indy, but she seemed a bit more comfortable this year when I saw her. I'll be interested to see what her race pace is. -It was pretty clear on Bump Day that Graham Rahal and Josef Newgarden would be solidly in the field. Both teams probably didn't sleep super-well after Pole Day, but honestly, not much was lost in terms of qualifying position for either driver. The 500 is a long race, so whether I qualify 23rd or 25th, I'm probably ok, so long as I get my setup right. -My goodness, what a long afternoon for Bump Day! It was pretty clear early on Michel Jourdain's car simply didn't have anywhere near the speed needed to challenge even Katherine Legge at just about 223mph. That's the way it goes, sometimes. It did at least afford plenty of practice time, and there was no shortage of craziness as everyone worked on race setup. Watching from the pits, it was a nice preview of the some of the speed we'll see on race day. When you're just yards away from these cars, it reminds you of the speed of Indy. It's an intense feeling. -Seeing Michel Jourdain in the garages around 3 pm yesterday, he looked pretty dejected. The team simply could not figure out what the deal with his car was, and even Graham Rahal jumping in didn't help. The last row of Daly, Lazier, and Legge looked pretty solid, especially with the baking heat coming down on the track. As it turns out, they were, and Jourdain is left on the outside looking in. What a brutal unfolding of events for a pretty good guy. That's the harsh side of Indy, but also one of the reasons it matters like it does. -Really, if a car is that far off the mark, as we saw with Jourdain's #17 car, it doesn't matter if Rick Mears jumps in it. A bad engine, tub, or other serious issue can wreck anyone's chances, no matter how strong their driver or program is. Is it something they should have identified earlier in the week, or was there another available option? That's something we probably won't ever fully know. -I was really impressed with how few incidents we had through the end of Bump Day. With the exception of Conor Daly's moment and Will Power brushing the wall, it was a very clean month. When you consider drivers such as Pippa Mann and Buddy Lazier having no previous DW12 seat experience before this month, and Katherine Legge getting only a few laps in the car this month before qualifying, it becomes even more impressive. 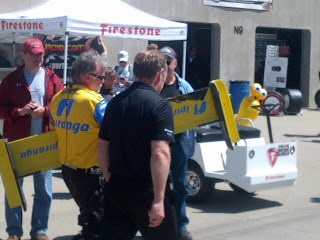 -Speaking of Buddy Lazier, I heard a few folks in person and online disparaging the relatively ragtag appearance of their crew and car at certain points over the weekend. To me, seeing a one-off team grabbing personnel from a few old IndyCar teams to make it happen was absolutely phenomenal. The Lazier entry wasn't the prettiest on track, and they didn't have the polish of Penske, but they had more than enough to make the show--and probably more if they needed it. Appearances don't matter--only results. There's always time to make things pretty after you're in the field. Congratulations to Lazier Partners Racing on getting it done--and picking up that Advance Autoparts sponsorship, to boot. -The IMS crowd loves Ed Carpenter, loves Tony Kanaan, and loves Marco Andretti. They really like James Hinchcliffe, Josef Newgarden, Pippa Mann, Simona de Silvestro, and a few others. Helio Castroneves is a rock star. -Every time I saw Mario Andretti this weekend, even when he was clearly occupied with other duties, he did everything he could to interact with fans, sign autographs, and take pictures as needed. I know it's been said time and again, but it bears repeating: he's an amazing ambassador for this sport. 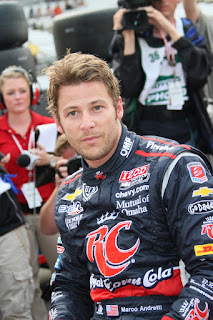 -So after all that, do I change my pick from Marco Andretti or Ed Carpenter to win the 500? No, I think I'll hold right there. There are plenty of contenders this year for addition to the Borg-Warner trophy, but I think those two are both in a really good spot to get it done. -The gates open for Armed Forces Bump Day at 7:30 am ET tomorrow, but there first cars will hit the track for practice from 9-10 am. Then, there's a 2-hour wait before spots 25-33 are filled, starting at noon ET and going until 6 pm. It doesn't look like adverse weather will be a factor, happily--the forecast is pretty clear. -The qualifying order probably won't matter much after the first hour, but it goes as follows (sans T car listings): Lazier, Beatriz, Saavedra, Daly, Jourdain, Rahal, Legge, Vautier, Mann, and Newgarden. -There are a few different groups of drivers going tomorrow that I'd classify. The first are the drivers I'm not really too worried about. Those would include Josef Newgarden, Graham Rahal, and probably Ana Beatriz and Pippa Mann. I think they all have enough speed to make it happen tomorrow. I think Tristan Vautier is probably here, too, though perhaps not quite so sure a thing. -The second group would be the remaining Chevy entries of Buddy Lazier and Sebastian Saavedra. Both didn't look stellar on Pole Day, but Chevy seems to have enough power to suggest that barring an accident, both entries should find their way in. -Conor Daly is in sort of an interesting category. I think he can find enough speed to make the field, but he's also had the "double" in terms of IMS issues this week--first a nasty crash, then all sorts of mechanical issues on his qualifying run. Hopefully, he's still in a good place mentally and can get that car qualified. -For the last category, there are those that I really have some concerns about. Michel Jourdain, Jr. is the slowpoke of the field right now, and there hasn't been much sign of improvement yet. What will be interesting will be to see how Katherine Legge gets up to speed in the #99 #81 car. Simon Pagenaud is safely in, but Vautier hasn't exactly been a lighting it up yet. Where will Legge land on the speed charts, and how quickly can she get up to speed? -While most eyes will understandably be on Legge tomorrow, there's also the question of Honda-on-Honda violence. Unless Lazier or Saavedra really get in trouble tomorrow, it looks very likely the 33rd position will be filled with a Honda. What happens if it comes down to Legge trying to bump Vautier? I'm not sure, but I bet it's messy. -If I'm Chevy, I think I'd play with the idea of throwing one more car out there, especially if Jay Howard has last-minute or somesuch. You've won this round; might as well spike the football. Before you say it's too late for that to happen, I suspect we'll have several hours of practice and open track time tomorrow. It could be done, if a team and Chevy wanted it to. I doubt it, but it's fun to throw it out there. -Speaking of track time, I'd expect everyone to go through once tomorrow, perhaps one or two more 2nd attempts, and then a long wait until later in the afternoon for more qualification attempts. There will be no shortage of cars on track, working on race trim, though! -Remember, each entry only gets three attempts to bump their way into the field, so after that, it's either so long, or scramble to get the "T" car qualified. -Right now, I'll go with Lazier, Daly, and Jourdain as my last three in, but all it takes is one bobble out there for everything to change in an instant. Plus, you never know when a team will find that last link they need to put it all together and move up the charts. I wanted to do a quick update before qualifying got under way today. I was feeling a bit under the weather last night, and actually overslept! I couldn't believe it--oversleeping on Pole Day, the best morning of the year! Yes, I said best morning of the year. As much as I love the entire race day experience for the Indy 500 itself, Pole Day morning holds a special place in my heart. It means getting in just after the gates open, sitting in the Pagoda Plaza, and just watching the Indianapolis Motor Speedway come to life. It means coffee and a pork tenderloin for breakfast, most years. It means having the sounds of the Gordon Pipers awaken the place as you sit and watch teams rush by, on some mission or another. It means seeing teams finally start to show their hand in morning practice. The expectancy and guessing that goes on all month finally begins to climb towards a resolution that will be played out between today and next Sunday. It's also a great time to get a wonderful feel for the scope of Indy. Walking up and down pit lane, if you look towards Turn 4, it's partially shrouded by an early morning mist. There's just no track like this one. I wasn't a total speed demon on the roads this morning, but I made good time, getting through the gates at 6:30am. As I write this, speeds are closing in on the 230mph range, we've just gone yellow for a bit moisture in the area. Most predict we'll have some interruptions today, but likely not a full-fledged deluge. Of course, if you're talking entries, the speculation today is all about the #99 Schmidt Peterson Motorsports entry, which we could see for Bump Day tomorrow. Katherine Legge is the most often-mentioned name is conjunction with the ride, and if the funding is there. She's been all over the Schmidt garages, and seems to be the most likely choice. If we do see the #99 car go out at this point, and it isn't Legge, I guess I'd be a bit surprised. More thoughts to come, but for now, we'll wait for the rain to get out of there and get some Pole Day qualifying action in! Once again this year, I've created a simple Pole Day guide, a single-page pdf that cuts out all the confusing and cluttering "T" car entries. Aside from basic driver/team info and actual qualifying order, it also lists each driver's top speed of the month. You can download it directly here. Have an awesome Pole Day, and let's hope the weather cooperates! Weather: The forecast calls for scattered showers over the weekend, but it doesn’t look as if we’ll see anything concrete. Still, we’ll have to see how things progress on both days. If there is bumping, or if teams know showers are coming in, we could see some tough decisions to be made, and some folks trying to work around the forecast. Remember, everyone will get at least one shot at the Pole or Shootout—but if they waive their turn in line, that’s it. As weather predictions appear now, there shouldn’t be too much trouble in getting qualifying in on either day, but this is May in Indiana. For all I know, I could be fleeing a hailstorm tomorrow, wearing a winter coat, or collapsing of heat exhaustion. The Importance of Pole Day: Pole Day matters, beyond just the importance of getting those bonus championship points for grabbing a good qualifying spot and the chance at a place in 500 history. Does it really matter if you qualify 24th or 27th? Well, it’s the difference between getting a couple more hours to work on race setup, for one, and not having to worry one more night about getting a qualification run in. In short, getting in on Pole Day this year should be a nice sigh of relief, and a chance to look ahead to the actual race. The Engine Battle Continues: Although it’s only a last-turn pass from being a tie ballgame, Chevy current is up 3-1 over Honda in the win department this year. Last year, a late Honda upgrade helped pave the way to add another 500 win to the engine manufacturer’s trophy case. We can’t expect the same this year, and Chevy’s teams have looked strong throughout the month. Can a Franchitti, Dixon, or Newgarden give Honda some front role representation, or will it will be a Chevy majority in the Shootout Saturday? The Little Guys: Of course, Lazier Partners Racing has been the resident underdog since the entry was announced for Indy, and they certainly have plenty of work ahead of them. There are some other one-off entries, part-timers, and the like that are looking at differing expectations this weekend. Lazier’s team will need to find some speed for a decent qualifying result. Pippa Mann has been turning some good no-tow speeds, but teammate Ana Beatriz has been struggling somewhat. 500 specialist Townsend Bell has been downright speedy, while veteran Michel Jourdain, Jr. has apparently not had any success with his car yet. Of course, by 6pm on Sunday, things could look very different. Let’s see who figures it out, and who has issues. Green, Green, Yellow: Not to jinx it, but this has been a remarkably clean month on-track---or at least it was until Conor Daly's crash Thursday afternoon. There have been a few big wiggles and scary moments, but through the end of practice Thursday, everything had been clean and green, aside from that single incident. Now that I’ve said that, I hope Friday isn’t full of a half-dozen cars walling it.We'll also have to see if Daly can get back in the saddle and find a nice qualifying speed. Polesitter Returns: We can’t forget about Ryan Briscoe, who’s in what should be an acceptably speedy Ganassi car for qualifying, and is last year’s polesitter. Briscoe has the experience and team to do quite well, and having been released by Penske after last year, might have just a hint more motivation to show just what he can do. Livery Watch: I’ve refrained from making a call on the best livery among these entries, but there are a few you’ll definitely want to scope out. Of course, everyone’s talked about Sebastien Bourdais’ chrome McAfee #7, and that’s definitely a car folks will be discussing for a good while. Carlos Muñoz’s #26 machine may well be the most colorful entry, with a blending yellow/orangish/reddish car that really needs to be seen in person. The almost day-glo color on EJ Viso’s #5 car is in the same category. 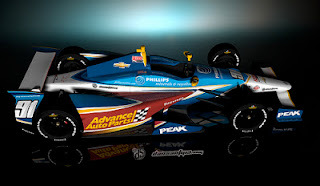 Outside of those, I really like the Superman theme worked into JR Hildebrand’s #4 livery, and Josef Newgarden’s Century 21 machine is simple, but very sharp and distinct. I also absolutely love the Sunoco colors and Turbo movie promo on Townsend Bell’s #60 car. There’s definitely a range in this year’s field, from some very busy designs to some rather plain ones. Still, as we always say, any sponsor that pays is a good one—right, Alex Lloyd? Pole Position Prediction: Those Ganassi boys are tricky, but I think it’s either Helio Castroneves, Marco Andretti, or possibly James Hinchcliffe. My gut says Marco, but we’ll see. Dark Horse: Carlos Muñoz is a rookie, but he’s been extremely fast so far. If he can hold it together for four laps, he could be at the very least a contender in the Shootout. If that's not Dark Horse enough for you (he has led multiple sessions, after all), how about Oriol Servia? He's been right with the leaders for most of practice, and we know he can qualify up front. Fantasy Racing: IndyCar Advocate Fantasy Racing is still going strong, and is still very much anyone’s league to win. Added to that is the fact that points will count double for Indy 500 picks. Picks are due by 10am ET today, so if you’re reading this before then, head over and get those picks made! I'll be out at the track Friday through Sunday, and would love to say hi and talk IndyCar and the Indy 500 with everyone. I'll try to have one of my customary orange polo shirts on, so if you see someone who looks like a portly traffic cone, that could be me. Have the very best of weekends, and enjoy everything there is to be had from the Greatest Race Course in the World. Act V, Scene I. A churchyard. A pestilence on him for a mad rogue! a' poured a flagon of Rhenish on my head once. This same skull, sir, was Yorick's skull, the king's jester. Let me see yon skull of nostalgic nature. Russ Snowberger in 1933; mark it well. Not one now, to mock your own grinning? quite chap-fallen? MY LORD. I entreat thee, attend. Yorick. Prithee, Horatio, tell me one thing. Canst thou name the last time a Novi qualified in the front row? -This will be a short notebook, since I was unable to attend practice in person today. Instead, I suffered through an interminable day of work. You know the sort of day in May; the sun is out, the sky blue, cars are roaring around the Speedway, and you find you've been staring at the same Excel spreadsheet in your cubicle for a quarter of an hour. You begin to concoct elaborate excuses to get over to the track, or at least to a spot where you can focus your attention on the online broadcast. The pull of the Speedway is a strong one, and it seems to stretch work hours accordingly. -How great was it to see Pippa Mann and Conor Daly on track today? Daly passes his Rookie Orientation, and Mann got through her refresher session with no issue. It seems as if we've been waiting a long time for those two to hit the track; Mann in a return, and Daly for his debut. -The Rahal Letterman Lanigan team certainly has had a slow start this month, with Michel Jourdain slowest on the combined speed charts so far, and the rest of the team in the lower third of the chart as well. There's little sense in panicking at this point, but it's at least worth keeping an eye on. We'll see how things change once qualifying engines are installed in the next couple of days. -Others have weighed in on the Derrick Walker hire as INDYCAR's President of Competition quite thoroughly, but I'll add my voice to those very pleased with the hire. Walker has plenty of common sense, respect in the paddock, and a realistic streak that should serve him well indeed. -Looking at the combined speed chart so far, only two of the top twelve practice speeds are currently Honda (Josef Newgarden and Takuma Sato). Again, we'll see what happens as teams change out engines, but I don't think Chevy will be caught off-guard again this year. For me, one of the biggest questions comes in asking just which Honda entries will crack the first three rows. Let's see how matters shake out once that boost kicks up, and with a few more days of practice under everyone's belt. I went out to Indianapolis Motor Speedway yesterday for Day 2 of practice. Opening Day had been cold, but warmed nicely. Day 2 saw the sun come out, but when the wind gusted, it was pretty chilly. The kids were freezing, so we didn't stay all day, but we got to see some runs from Ryan Briscoe and the Andretti boys. It was cool to see Carlos Munoz lead practice as a rookie, and even better to see him avoid a scary incident by a little grass-cutting. We had such sweltering weather last year at the track, and this year has ranged from fair to downright frosty in comparison. If we can hit a happy medium by the weekend, I'll be thrilled. But the weather has also brought a lot of uncertainty with it. A number of team members I spoke to over the weekend indicated they were limiting their running until Monday or Tuesday. Of course, there's nothing to say that race weekend wont be 50 degrees and windy, but it doesn't seem as if there's a whole lot of deep progress being made out there. The wind doesn't help it; there were some nasty gusts, and several drivers took to social media to talk about getting shoved around out there. The other part of the equation, which was touched on a bit on Saturday, is the fact that teams are still assembling and prepping after Brazil. Pippa Mann and the #63 Dale Coyne team decided to wait another day to get some laps in. The other two Coyne drivers, Ana Beatriz and Justin Wilson, have likewise not taken laps. Conor Daly won't turn a lap for his Rookie Orientation until likely this afternoon. Rahal Letterman Lanigan Racing's entries have turned just over a dozen laps apiece. Outside of rookie AJ Allmendinger, Team Penske has run very little. We won't see Buddy Lazier's program until Wednesday, and if the #99 of Schmidt Peterson Motorsports runs, it will be a late entry indeed. If there's a common thread here, it's that it all adds up to a big puzzle. We don't know how the Coyne cars will run. 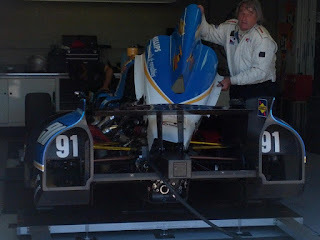 We don't know what Buddy Lazier and the Great Hemelgarn/Conquest/Other Hybrid team can muster. We don't know if a new look for Dragon Racing will accompanied by a new direction on the year. We're not certain what will happen to teams when the boost is turned up for qualifying, or what the Foyt entries can must, or what Penske and Ganassi are doubtless hiding up their sleeves. Weather, winds, and works in progress equal only speculation for the die hard Indy fan. As if to punctuate an already wild season, the first few days at the Greatest Race Course in the World have told us little about how the remainder of the month will go. From looks of it, we'll have to take our bits and pieces of information as they come. With wind expected in the early week a few nice days, and the specter of showers headed into the weekend, every day could very well take place under markedly different conditions. -It was a cold start to this year's Month of May at IMS, but the day warmed up nicely. Still, I ended up grabbed a couple of hot chocolates for the kids not long after the gates opened. -The Gordon Pipers are tremendous, whether they're marching or performing in place. I know that might sound cliche for a 500 fan to say, but seriously, that is the soundtrack to start my May. You wouldn't normally put bagpipes and racing together, but somehow it just works. -Kudos to IMS for having a couple of other musical acts out there today, including the High Octane Drumline. These guys play at Indiana Pacer sometimes, but they were a nice addition out at the track. -The Celebration of Automobiles has become the crown jewel of Opening Day. There are just so many cars to look at--Duesenbergs, Packards, Marmons, Rolls Royce, classic roadsters, a vast range of vintage pace cars--cars you could just about cry over, they're so perfect. It's just a fantastic addition to the festivities, and fitting event for the Cathedral of Speed. -The Social Media Garage had two driver events today, and both seemed very well-attended. Pippa Mann and Josef Newgarden are two popular drivers at Indy, and I'm impressed with the Speedway's continued push to integrate social media and current technology into their plans, and I hope they keep pushing in the same direction. -Not a whole host of cars saw track today, but that doesn't mean it wasn't productive. Rookie Orientation went over without any major speedbumps, all three rookies who could go out today passed, and the we got to see drivers such as Ed Carpenter, Helio Castroneves, and Josef Newgarden turn quite a few laps. Still, talking with some of the crew guys, it's pretty clear that we won't see a full track until probably Monday or so. Teams are still turning around from Brazil, and today there were even folks in the pit area applying needed decals to stands. -Plenty of discussion today about the #99 entry for Schmidt Peterson Motorsports. Buddy Rice is the most likely candidate by far (although no official announcement was made), but of course other names like Jay Howard and even Katherine Legge popped up on the radar, too. That's just part of the fun of May, is getting to play Conspiracy Theorist/Detective. I'm surprised George Snider wasn't brought up. It does seem very likely we'll have at least 1-2 more drivers added, though--with that number including Rice or whomever jumps in the 99. Bump Day seems safe. -The kids had a blast today, and I'll be taking my girls back tomorrow for more. It's going to be a cold day, but any day at the track is a good one, as far as I'm concerned. We'll see how many cars make it out on track. Paul Page – Welcome Home! Four months and change until the Grand Prix of St. Pete, and I can't wait! IndyCar News Two Days In a Row!?! ?